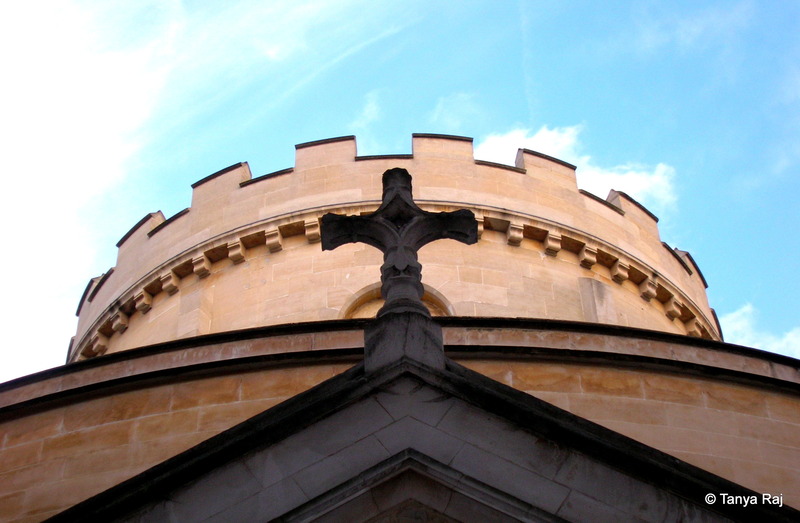 The Knights Templar have captured my imagination ever since I can remember and I have spent numerous waking hours reading about them – some conspiracy theories, but some fascinating facts too. So, it is of little surprise, when I found out about the existence of a temple connected to the legendary warrior monks in the heart of London, I had to visit it. Statue with two knights on a single horse carrying a flag at the courtyard of the Temple Church. Just off Fleet Street, near the Temple tube station, stands this easy-to-miss 12th century Temple Church that was once a location for Templar initiation ceremonies. 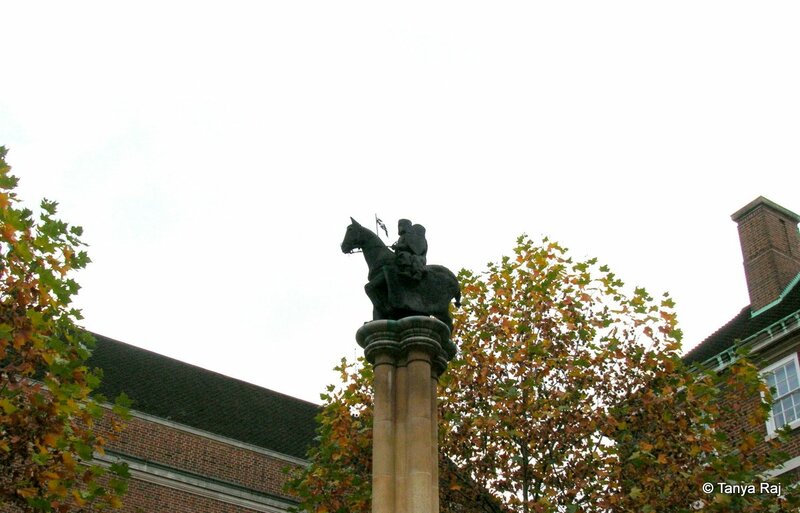 Outside at the courtyard, atop a stone pillar, sits a statue with two knights on a single horse carrying a flag. The premises are empty barring a newlywed couple and their wedding photographer perfecting a few last-minute shots. A cross at the circular section of the structure that serves as the nave, but was original church. Towards my right stands the church, which comprises of two distinct structures. On further reading the information board near the small entrance at the intersection of the two structures, I learn that the round section behind is the original church which now serves as the nave and the rectangular section in front was built approximately 50 years later and now is the chancel of the current church. 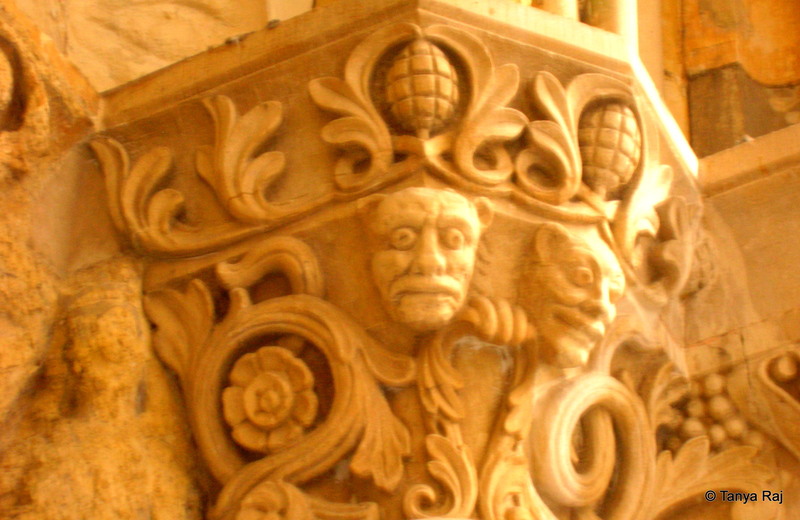 Gothic motifs at near the nave’s entrance. Barring a young couple, I am only one inside the church. Towards the left of the entrance is the nave and on the right, is the cancel with the altar. I instinctively turn left and come across the stone effigies on the floor, guarded by low raised iron bars. These date back to 13-14th century and represent the knights in their armour as they would have worn it in that era. 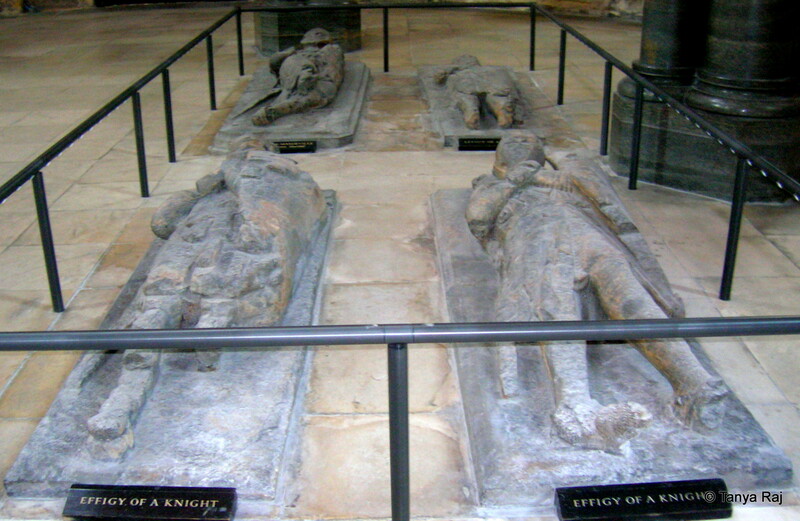 Stone effigies of the knights. A little ahead, near the western door, which was the initial temple’s entrance, stands a circular marble structure, about 2.5 feet tall, and detailed with Greek motifs. It is through this door that the new recruits would enter the church at dawn for initiation ceremonies, and take a monastic vow of piety, chastity, poverty, and obedience, to become part of the Knights Templar. 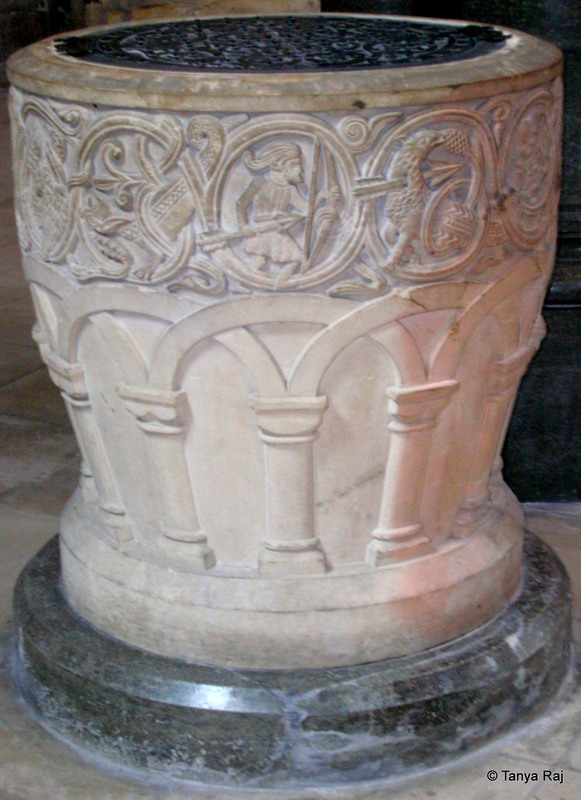 A circular marble structure, with Greek motifs near the nave’s door where the new recruits would enter the church at dawn for initiation ceremonies, and take a monastic vow. It is fascinating how a religious order that asks for poverty to be one of the vows also went on to become a cornerstone of modern day banking. In their core principle to defend the Christian pilgrims to Jerusalem, the knights invented a system for safeguarding the pilgrim’s money during the long treacherous travel across Europe to Jerusalem. 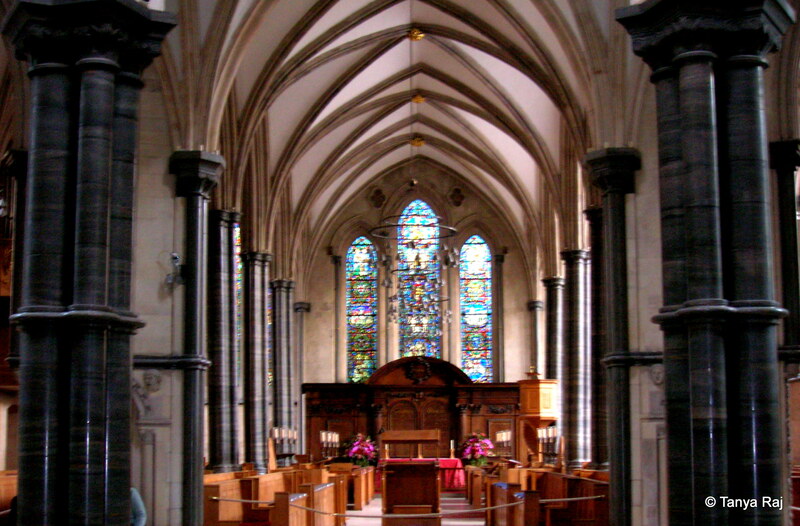 To avoid carrying large sums of monies, the pilgrims would deposit their cash at here at the Temple Church in London, take a letter of credit, and encash it in Jerusalem. The power that the Knights Templar wielded can be inferred from the fact that all their activities – religious and commercial – had the support not only from the royalty and nobility of Europe but from the Pope too. Stained-glass windows depicting stories from The Bible. Walking around the circular nave, the walls are commemorated with marble plaques, inscribed with numerous names. Tall stained-glass windows depicting stories from The Bible tower above them. My eyes wander towards the columns that have a Victorian-Gothic element to their style. 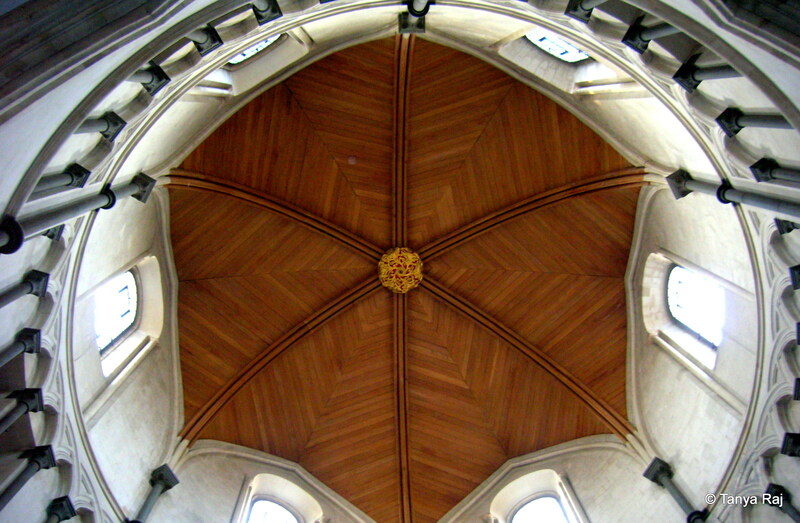 Further up, is the dome of the nave – a six-sectioned woodwork that looks like a dichotomy in this stone and marble church. Windows around the dome flood in the daylight and at the centre of the dome, holding it all together is a large, intricate wooden rose, painted in red and gold. A single wooden rose at the centre of the dome, with intricate details in red and gold. Stained-glass windows and hanging metal chandeliers give a sense of harmony to this place. Right opposite the stone effigies, the cancel of the church is a beautiful spot with rows of pews leading up to the wooden altar. 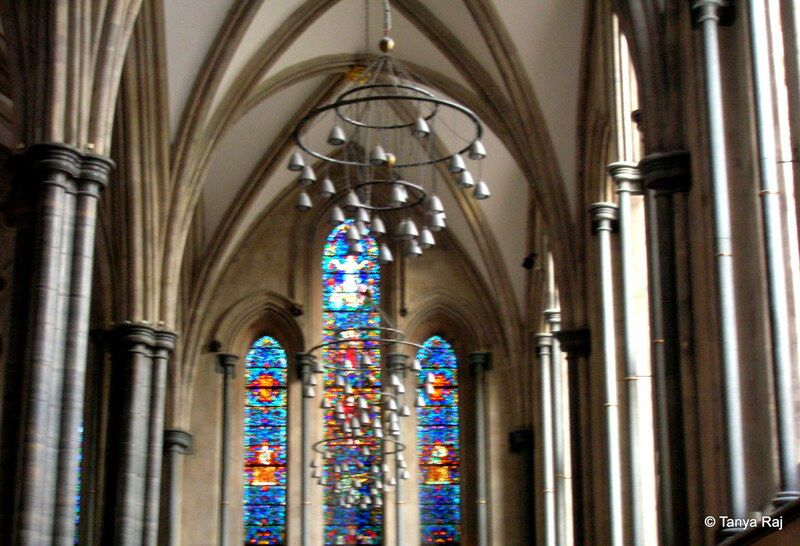 Behind it, the symmetrical stained-glass windows and hanging metal chandeliers, complete the picture. 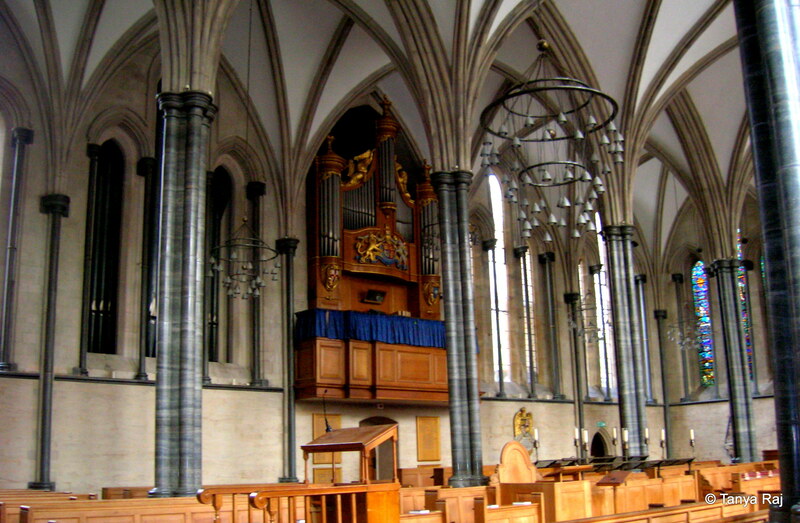 Sectioned into three areas, the left side houses the wooden pipe organ, decorated with animal motifs in gold, grey, and blue. This section is cordoned off and I can only stand near the black pillars that demarcate the nave from the cancel and admire the harmony of it all. The section of the cancel with the pews and altar. Upon the leaving the church, I walked towards The Thames, found an open spot and while making these notes, could not help but wonder how much of our modern lives have been touched upon by the women and men who went before us. This heritage in intangible and we can only live them through these structures that remain and the history that it contains.